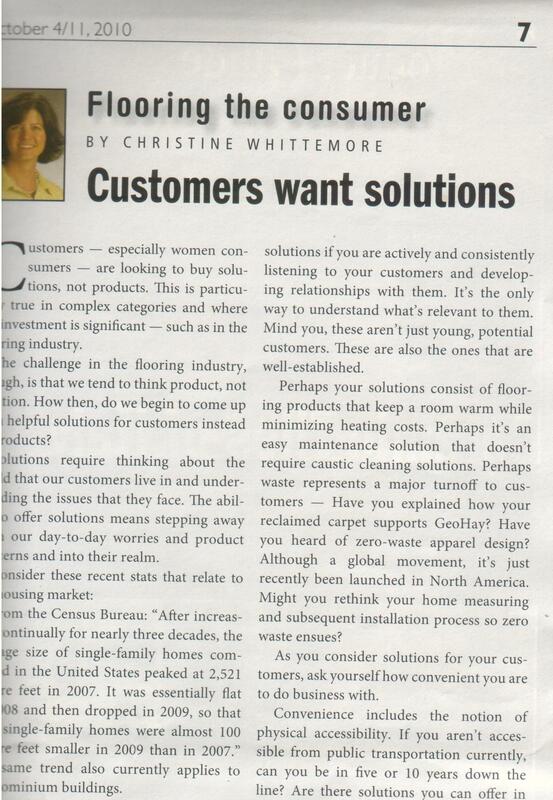 This article titled "Customers want solutions" appeared in the October 4/11, 2010 issue of Floor Covering Weekly, about the retail experience. 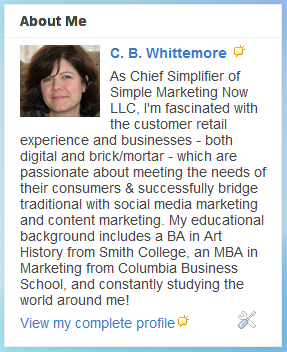 Customers, especially women consumers, buy solutions, not products. This is particularly true in complex categories and where the investment is significant -- such as flooring. The challenge in flooring, though, is that we tend to think product, not solution. How then to come up with solutions for customers instead of products? Solutions require thinking about the world our customers live in and understanding the issues they face. Solutions mean stepping away from our day-to-day worries and product concerns and into their world. From the Census Bureau: “After increasing continually for nearly three decades, the average size of single-family homes completed in the United States peaked at 2,521 square feet in 2007. It was essentially flat in 2008 then dropped in 2009, so that new single-family homes were almost 100 square feet smaller in 2009 than in 2007.” The same trend applies to condominium buildings. From a consumer perspective, there’s more talk about urban living and diminished reliance on cars. Were you aware that since 1978 fewer young people have been obtaining driver’s licenses? 92% of 19 year olds had licenses in 1978; in 2008, the number decreased to 77%. That’s according to the Department of Transportation. Internet communication tools have only precipitated this decline and increased the interest in public transportation to maximize one’s available digital and communication time. No wonder consumers have adopted a new definition of value that encompasses not just price and brand, but also convenience! Our consumer is shifting to smaller living spaces, looking for increased energy efficiency, not driving as much and shifting to urban environments -- lots of change and adapting to new realities. That means opportunities for providing solutions if you are actively and consistently listening to your customers and developing relationships with them. It’s the only way to understand what’s relevant to them. Mind you, these aren’t just young potential customers. These are also the well-established ones. Perhaps your solutions consist of flooring products that keep a room warm while minimizing heating costs. Perhaps it’s an easy maintenance solution that doesn’t require caustic cleaning solutions… Perhaps waste represents a major turnoff to customers: have you explained how your reclaimed carpet supports GeoHay? Have you heard of zero-waste apparel design? Although a global movement, it’s just recently been launched in North America. Might you rethink your home measuring and subsequent installation process so zero waste ensues? As you consider solutions for your customers, ask yourself how convenient you are to do business with. Convenience includes the notion of physical accessibility. If you aren’t accessible from public transportation today, can you be 5 or 10 years down the line? Are there solutions you can offer in the interim – perhaps a van on peak travel days? Are you hosting events that appeal to those just getting established in new apartments and condos? Consumers, especially women customers, want solutions that truly meet their expectations; they want a convenient retail experience that offers total peace of mind. They want to be able to trust that they will be respected and not abused. 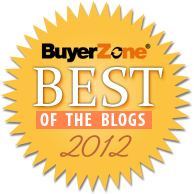 How do you assure your customers that are true to your word? How do you bring transparency to your transactions? Time-pressed, resource-constrained, skeptical consumers won’t tolerate inconsistent experiences – in-store as well as online - that don’t respect them and inconvenience them. Customers may be considering differently configured living spaces and concerning themselves with energy efficiency and practicalities as never before. However, they still seek to make their home the most beautiful and relaxing place it can be. That’s where solutions come in! By the way, have you seen this Fast Company Magazine article titled What Your Home Will Look Like In 2015? What's your reaction to solutions vs. products in the retail experience?